Aristotle is a confused teen with an elder brother in prison- who no one ever mentions. He barely has a relationship with his ex-veteran father and prefers to be alone all the time. When both immigrant teens meet one summer day, they begin hanging out unsure of where their friendship will go. What they discover is a relationship that lasts a lifetime and the opportunity to make a difference in each other's lives. Benjamin Alire Saenz won the Stonewall Book Award and Michael L. Printz Award for his tremendous writing in this novel. He clearly depicts the emotions of both the main characters- who are each represented through their own point of view. More than anything, this novel is about the struggle of self-discovery and identifying the difference between your background and your current life. 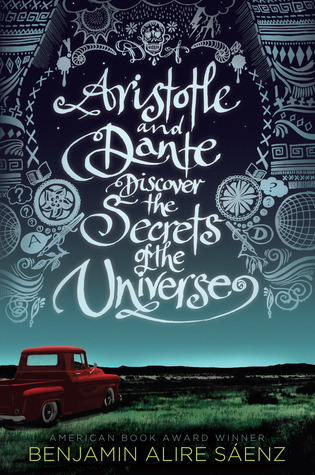 Both Ari and Dante are Mexican-American immigrants, although each of them see their culture in drastically different ways. 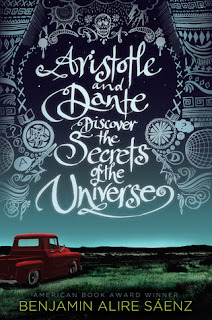 What's more, Ari and Dante themselves are drastically different, but make a great pair. They teach each other to see the error in their ways, open up about themselves and introduce their families to one another's. They are practically family. Everyone I know who has read this book has absolutely loved it. I'd recommend it for fans of the Young Adult Genre who aren't necessarily looking for a romance book. If you enjoy LGBT literature then this book is for you as well. I've heard a lot of great things about this one. Glad to hear you liked it as well. I need to decide if my 8th graders at my school will like it or not. I'd just finished 8th Grade when I read this book- I'm sure they'll love it! I'm so glad you enjoyed this one! I finally picked it up this year or rather I listened to audiobook and it was fantastic. There is so much heart in this one and I always appreciate books that feature Mexican-American like me!